This stone has been one of our most popular stones over the years and it is certainly very beautiful but this light, dusky pink crystal brings more than just happiness to the eyes. The meanings and powers that are thought to be connected to rose quartz are fascinating and we thought it fitting to give you an insight into these powers with Valentine's Day fast approaching. This pale pink natural beauty is known as the stone of unconditional love and infinite peace. It is said that the stone opens the heart chakra to all forms of love. All quartz have high energy properties and rose quartz is said to have the power to bring love into life and daily situations as well as bringing inner warmth, lowering stress and soothing those around it. The stone its self is usually translucent sometimes even transparent, it is easily found around the world in destinations such as South Africa, United States, Brazil, Japan, India and Madagascar. 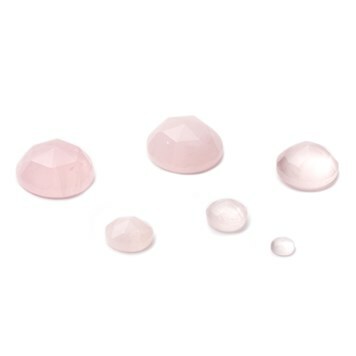 The pink colour of rose quartz is thought to be determined by small amounts of titanium. It is normally found in large lumps rather than crystals which are then carved in to cabochons, faceted stones or beads as well as tumbled rough cut nuggets. 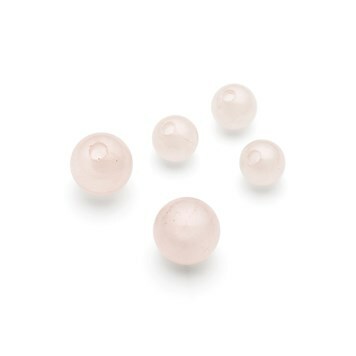 Rose quartz is quite brittle, it measures 7 on the Moh's scale and can be easily chipped so be careful when using this gemstone in your jewellery designs and make sure it is protected enough on any vulnerable areas. Rose quartz has been commonly used in love spells. If you are single and looking for love it is said that its powers can be used to great affect by placing a piece of rose quartz beside your bed. This will draw love and relationships towards you. It has been reported that sometimes the powers can be so strong you will need some amethyst to calm things down. In an existing relationship placing the rose quartz beside your bed will restore harmony as it takes away negative vibes and replaces it with loving and positive vibes. It has also been said that rose quartz can increase fertility. This beautiful stone is thought to be able to heal heartache as well as open your heart to receive love again - both for yourself and others, as love for others will only follow after you have found love for yourself! 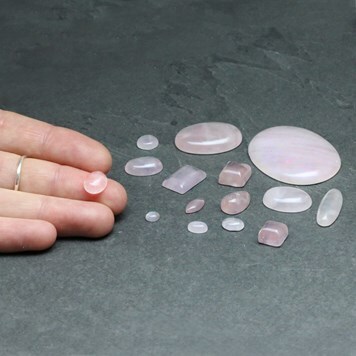 If you have a rather hectic household rose quartz is said to be perfect for gently bringing calm in to children. Placing a piece of unpolished rose quartz under a baby's cot will help to sooth restlessness. It is even thought to help with teenage angst. The gemstone is said to help keep away nightmares and aid in the recovery of behaviour and food related disorders. Animals have also been said to respond well to rose quartz, especially excellent for rescue animals who may be traumatised to restore peace calm and love to them. It is said that if you have a hyperactive animal you can feed them water in which a Rose Quartz crystal has been soaked in for several hours to help calm them. Another use of rose quartz has been to place a pointed piece of the stone on your workspace to work as a barrier to any unwelcome intrusions. You can also circle the stone in an anti clockwise motion around your phone to absorb any negativity from incoming calls. This magical stone is thought to strengthen the physical heart and circulatory system. It is said that it releases impurities from body fluids and can aid chest and lung problems, heal the kidneys, adrenals and even work on alleviating vertigo. The pale pink represents kindness, families, friends and children. It also symbolises new love and trust after a betrayal or abuse. It is known as a gentle healer and is thought to help with disorders relating to babies, children, adolescent girls and pregnant / menopausal women as well as relieving ear and gland problems and headaches. 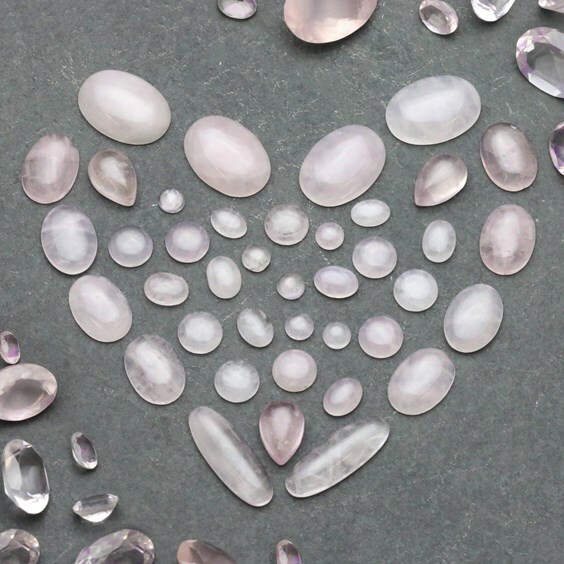 Rose quartz has been used within jewellery making for centuries, often used as a token of love. With a wide range of options available such as cabochons, faceted top cabochons, faceted stones, beads and broilettes the design possibilities are endless. Its subtle colour also makes it a versatile stone that looks great with both gold and silver. Check out some of our favourite customer designs using rose quartz and don't forget to check out their Instagram feeds too! Gemstones - Dorling Kindersley Handbooks.